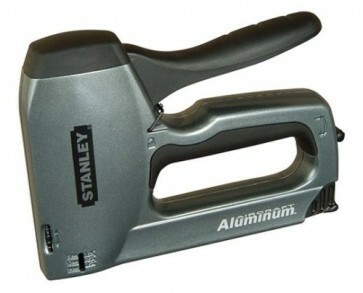 The Stanley 0TR250 is a heavy-duty Stapler / Nail Gun and is fitted with and easy push handle that will penetrate the staple or nail into the workpiece with ease. The pinch point free design helps to protect cables so that they do not to get crushed on application. This Stanley 0TR250 has an aluminium cast housing for greater durability and strength, is fitted with Hi-Lo adjustment to match density of materials and has easy access staple and brad insertion for faster loading. This staple and nail gun has a lock down handle system fitted for easy and neat storage. It will accept heavy-duty staples and brads for multiple applications from cable laying, upholstery work, fencing, architrave fitting and much more.